Iliotibial band syndrome, (ITBS) is an overuse or compensative injury of the connective tissues on the outer part of the thigh and knee. Iliotibial band syndrome is the most common cause of lateral, (outer) knee pain in runners and cyclists. The iliotibial band, (ITB) is a thick band of tissue that begins at the hip and runs down from the outer part of the thigh to the outer part of the knee. The iliotibial band helps stabilize the outer part of the knee through its range of motion. Inflammation of the ITB occurs during excessive bending, (flexion) and extending of the knee joint as the ITB rubs excessively over the femoral condyle, creating irritation and pain on the outer side of the knee joint. Muscular imbalances; e.g. weak hip abductor muscles. Pes Planus/Cavus, (flat feet/high arches). Sudden increase in mileage or track/interval training. Running up/down too many hills. Rowing and weight lifting, especially with excessive squatting. Cyclists may also develop ITB inflammation should they have incorrect posture on their bike and pedal rotatory technique. The issue may even be how the toe clips are aligned, forcing the foot to be internally rotated. This can cause the same effect as bowed legs, increasing the angle of the ITB as it crosses the knee, increasing the risk of inflammation. Another possible cause is unilateral pelvic dysfunction, with compensatory ITB tightening, protecting the knee after subsequent gluteal weakness, in response to pelvic dysfunction. The Sports Injuries Specialist – Registered Osteopath will evaluate the underlying cause of the problem by looking at muscle strength, balance, flexibility and gait analysis, (watching a person walk, run or cycle). Shoe orthotics may also be useful if there is a gait problem, pelvic tilt, leg-length discrepancy, or pes planus/cavus as a potential cause of ITBS. Treatment: Knee Pain – ITB – ITBS – Iliotibial Band Syndrome – Outer Knee Pain – Orthotics. Treatment at Chelsea Osteopaths by The Sports Injuries Specialist – Registered Osteopath., Chelsea Osteopaths How Knee Pain is treated at Chelsea Osteopaths by The Sports Injuries Specialist – Registered Osteopath. Knee conditions are treated with gentle, non-invasive techniques designed to help improve blood circulation, drainage of waste products and accumulated toxins. Most patients may find relief from pain and discomfort through conservative treatments and hot/cold therapy. ITBS can in most individuals be treated successfully with conservative methods by the Sports Injuries Specialist – Registered Osteopath. Patients will receive education and treatment by The Sports Injuries Specialist – Registered Osteopath, as well as a personally tailored program to assist them in attaining full recovery. If you are in Extreme Pain and suspect ITBS, then call the Sports Injuries Specialist – Registered Osteopath immediately for exceptional results. 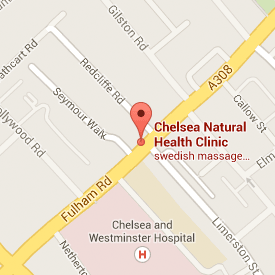 CHELSEA OSTEOPATHS: 208 FULHAM ROAD, CHELSEA, LONDON. SW10 9PJ.